Jacque is a Witch and she is carrying a frog (Frog tongue is a Party-Blower.. the kind that uncoils when you blow on it Ü) in a big pot! Guess we know what will be served for dinner.... Frog Stew anyone? 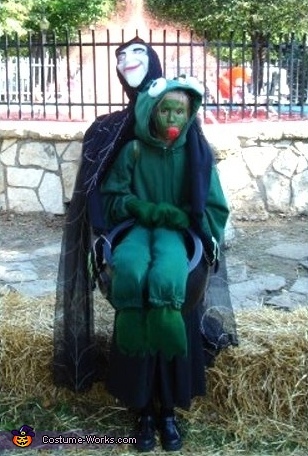 This homemade costume for kids entered our 2008 Halloween Costume Contest, and won 5th place!